​Is Ceramic Coating Worth It? For any car or boat owner, keeping a car's paint or boats fiberglass and gel coat pristine is always a challenge. The go-to solution has always been the tried and tested application of wax from day one of purchase. Periodic applications (sometimes frequent reapplication) of the same is needed to maintain the wax coat, as it is slowly removed via exposure to the elements. Times are changing, however, and so has finishing and refinishing technology. Automotive paint nowadays is a bit different and boats have gel coat and painted surfaces. On cars, instead of piling layer upon layer of color pigment to produce a deep shine, a somewhat 'sacrificial' clear topcoat is now applied to give the paint luster. Wax, of course, is still the go-to, as is its frequent reapplication. Recently, a newer solution has been making its mark on the auto and marine scene. It's sold under many brand names, but is generally referred to as ceramic coating. This has been common since the '90s as a method of improving engine performance, but its application in paint and marine protection is relatively new. However not all of these coatings, even if labeled as "ceramic" are ceramic. Liquid Armour 9H is a certified and independently tested coating that is the only one to have passed a 240 hour SGS salt corrosion test. Like that used for enhancing engine efficiency, Liquid Armour 9H ceramic coatings are bonded to a substrate (in this case paint or marine surfaces) on a microscopic level to protect it from the effects of its environment. In the case of car paint, this is constant pelting by minute dust at speed, exposure to smog, rain, bird droppings and the occasional scuffing against jeans or other objects. For boats its much worse, well with salt, and sand added into the above mix its a challenge to maintain these surfaces. The most common method of coating requires that the paint or marine surface be cleaned and as free of contaminants as possible. This may require removal of old wax, claying, and the application of other cleaning agents. Application is via a applicator or airbrush sprayer. It is applied sparingly compared to traditional paste or liquid wax, with surfaces measuring 24" x 24" in size quoted as requiring only 10 drops or less of the coating. Using more isn't beneficial, and can possibly be detrimental as you may end up with an unnatural, uneven finish. It's also recommended that application of the coating be done indoors as to avoid dust, rain, falling debris..you get the idea. While the coating itself is only a few to several microns thick, every step that can be taken to ensure a better result is always welcome. Finishing up requires nothing more than wiping off the excess with a microfiber cloth and leaving the surfaces alone to cure for the next 24 hours (7 days for full cure). Afterwards, you will be left with a water-repelling hydrophobic surface that's much easier to clean, and keep clean. With Liquid Armour 9H, the resulting finish is also rated 9H on the pencil hardness scale. Some brands are manufactured for enthusiasts, while others are made for application by experienced and trained professionals. 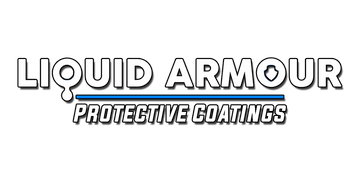 Liquid Armour Protective Coatings are for both pros and DIY users. When applied by a certified installer Liquid Armour 9H is offered with a warranty on the result as long as certain care procedures are followed. This will include periodic washing's and removal of tree sap and other droppings as soon as possible. Is it a good investment? Done right, you bet it is!